A while back we announ­ced plans for a tool that would help you trans­fer your cir­cles from one Goog­le+ account to ano­t­her and ensu­re that your fol­lo­wers are auto­ma­ti­cal­ly direc­ted to your new, pre­fer­red pro­fi­le. 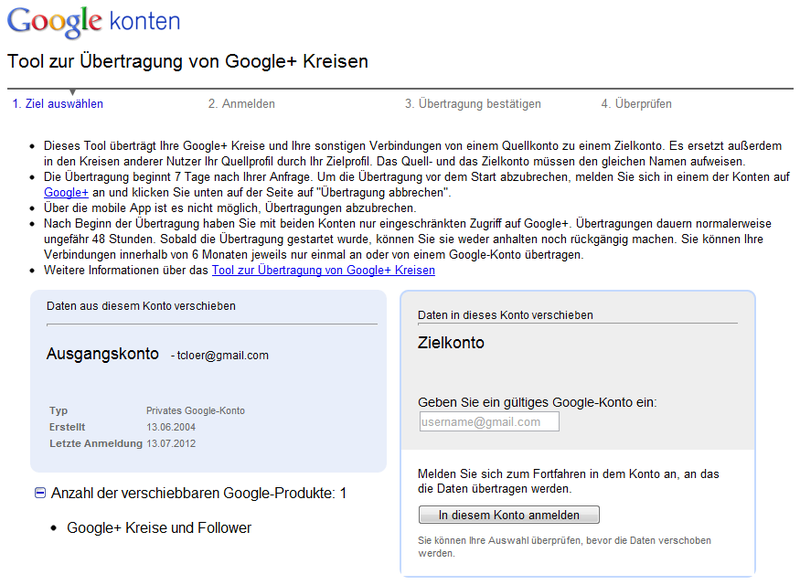 Today, anyo­ne can visit Goog­le Take­out and click “Trans­fer your Goog­le+ con­nec­tions to ano­t­her account”. Als ich das heu­te früh gele­sen habe, dach­te ich im ers­ten Augen­blick: Toll! End­lich das Trans­fer-Tool für Google+-Konten, auf das ich schon so lan­ge gewar­tet habe. Con­tent from your source account (such as pro­fi­le infor­ma­ti­on, posts, or comments) is not trans­fer­red to the desti­na­ti­on account. Simi­lar­ly, aut­hor­ship infor­ma­ti­on and Goog­le+ pages that you mana­ge with your source account will not be trans­fer­red to the desti­na­ti­on account. Howe­ver, this con­tent, pages, and aut­hor­ship infor­ma­ti­on still exist in your source account. If you choo­se to keep your source account pro­fi­le, to avo­id con­fu­si­on, you may want to dele­te any con­tent (inclu­ding posts, comments and pho­tos) that was posted by the source account and uncheck the opti­on that helps others to dis­co­ver your pro­fi­le in search results. Für ein Unter­neh­men, dass von Algo­rith­men getrie­ben ist, fin­de ich das ver­dammt unlo­gisch. Ehr­lich.